If it seems like a long time since the last proper Burnout title that didn’t have the word ‘Paradise’ in its title was released you’d be right. Burnout 3: Takedown released on the beloved PS2 back in 2004 (sadly, Burnout: Revenge was an Xbox 360 exclusive owing to a set of distinctly haggard circumstances), and in the intervening period of nearly a decade and a half no other game has quite managed to honor the spirit of those earlier, pioneering racers. With Dangerous Driving, Three Fields Entertainment who are the British based developer which arguably made up the core of Criterion Games back in the day, have managed to do just that; grasping what made those frenetic racers so appealing all those years ago and in doing so, crafting an effective spiritual successor in the process. From the eye-bleeding, nitro-infused velocity you can attain to the crushing, camera-snap takedowns that have long been synonymous with Criterion Games finest labor of love, Dangerous Driving absolutely feels and handles like the pre-Paradise Burnout that you remember. The smaller details are firmly in place too – an Aftertouch style mechanic allows you to drift for a little while after crashing into other cars for maximum destruction, while driving into oncoming traffic and experiencing near misses fills up your nitro bar pleasingly quickly in a fashion that Burnout stalwarts will be accustomed to. Dangerous Driving absolutely nails the sense of speed that the early Burnout games were famous for. Most crucially of all, it’s that classic Burnout feel that Three Fields Entertainment have gotten spot on. Enabled by a silky smooth framerate that would appear to resolutely cling to 60 frames per second on PS4 Pro (regular PS4 folks will play the game at 30 frames per second), Dangerous Driving’s handling model responds to your every command and direction, no matter how slight or extreme. As a result, classic Burnout veterans will be able to pull off slipstreams, drifts, double takedowns and other manoeuvres from their halcyon days with reassuringly familiar ease. 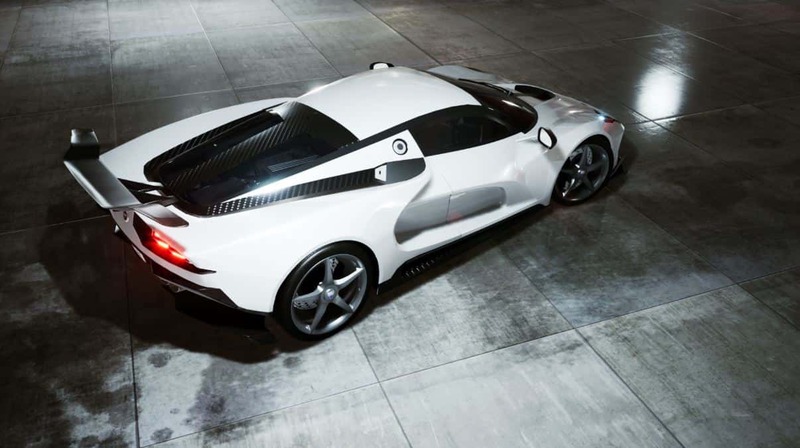 Beyond the fundamentals, it also helps that Dangerous Driving looks the part too. 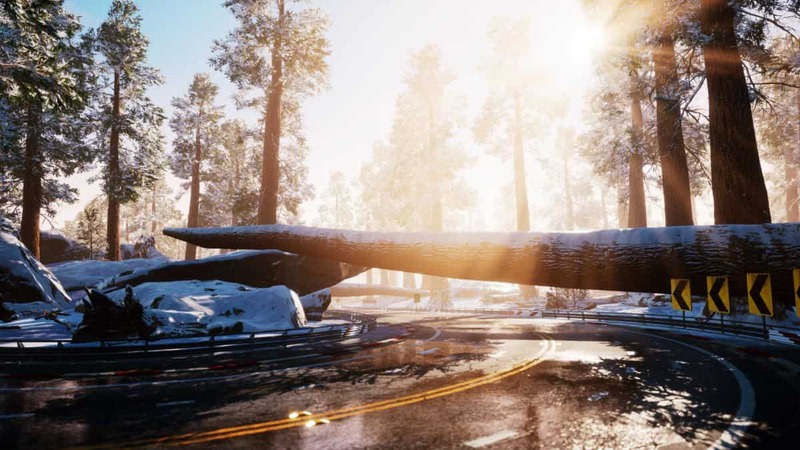 In addition to the liquid smooth framerate, the 30 or so tracks that Dangerous Driving boasts are appropriately detailed – sun-dappled roads give way to winding hills, snow-blotted cliffs and sea-side tarmac expanses. Dig into Dangerous Driving’s game modes and, again, fond memories of the Burnout of yesteryear spring forth as tiered racing championships that encompass each of the game’s nine modes reveal themselves, adding yet further credence to the notion that Three Fields Entertainment know exactly what buttons they’re pressing with regards to its target demographic. Initially then, Dangerous Driving would seem to be quite the concentrated and potent hit of weapons-grade nostalgia, but peer behind the opening thirty minutes or so of that distilled Burnout goodness and it soon becomes clear that Dangerous Driving’s budget isn’t quite high enough to stand shoulder to shoulder with its commendably strong fundamentals. The nine or so game modes that Dangerous Driving encompasses will all prove familiar to Burnout veterans. Dangerous Driving’s budgetary constraints are most keenly felt, or rather heard, in its soundtrack. After a bop-worthy number gets you through the title screen and into the game proper, it soon becomes apparent that, in fact, Dangerous Driving has no in-game soundtrack at all – instead seemingly content to defer to the hungry revs of monstrous car engines and the oft-heard smash-racket of twisted car chassis. It’s amazing how you truly don’t realize how much you value something until it isn’t there anymore. Absent of the bouncy punk beats of Billy Talent’s Red Flag, and bereft of Ash’s Summer-tinged, hope-stuffed anthem Orpheus, Dangerous Driving can seem disappointingly hollow at times; the lack of soundtrack corresponding with a lack of adrenaline that so often used to accompany these tuneful echoes from the past. Elsewhere the tracks themselves, though beautifully representative of takes on America’s numerous rural expanses with multiple paths which can be taken during each race, find Burnout 3’s urban sprawls missing from their number. This makes Dangerous Driving’s races feel much more akin to brisk countryside outings, rather than the sort of breakneck city speedways that the classic Burnout titles had long since burned upon the eyes and minds of those who braved its winding streets and roads that were lined with man-made hazard and obstruction. By perfecting your performance in each of Dangerous Driving’s events, you can earn higher ranked medals which in turn unlock new cars for you to fling around the track. Then there is the general presentation side of things. 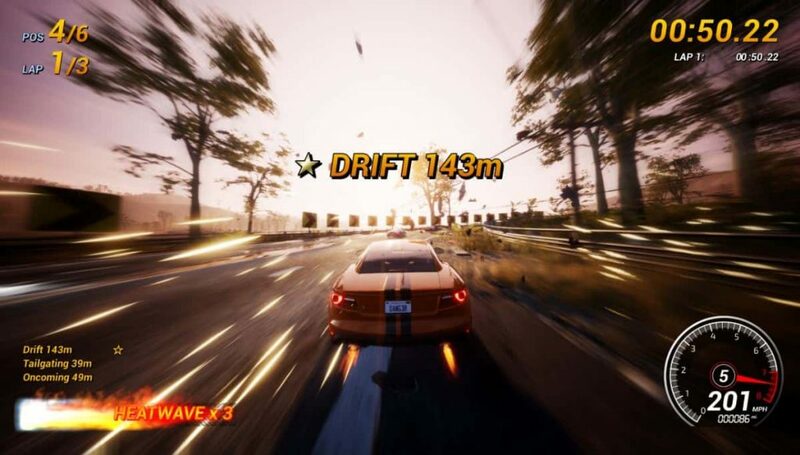 Though Dangerous Driving is an undeniably attractive prospect when glimpsed at full flow during any one of its action-packed game modes, the presentation and UI which threads together the experience is anything but. With basic menus and events that are all name rather boringly and conservatively – Face off 1, Road rage 3 and so on, it’s clear that some extra shine and polish in this regard would have been well received. 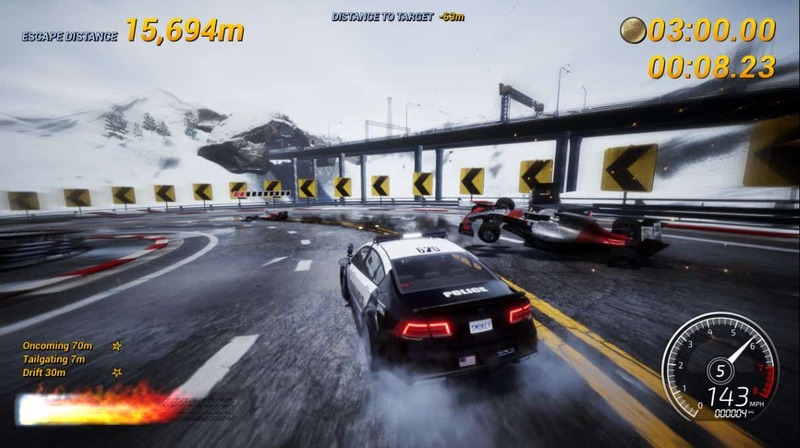 Speaking of what may have also been well received, at present Dangerous Driving does not support any kind of multiplayer – online multiplayer is promised as a free update within the first month of the game’s release, but all the same the lack of additional non-offline game modes somewhat narrows the appeal of Dangerous Driving’s launch day offering. Elsewhere, those expecting to relive the chaos of the classic Burnout games Crash mode will be disappointed; the vision that Three Fields Entertainment have for this first iteration of Dangerous Driving clearly doesn’t extend to mimicking this part of its classical inspiration, not least because the previously released Danger Zone games already accommodate this entertaining distraction on their own. Despite not quite having the budget to fully support its ambitions, Dangerous Driving is nonetheless a satisfying beast. Wickedly fast and generously stuffed with a range of different modes, cars and tracks to scream around on, Three Fields Entertainment have arguably got their priorities right in nailing the fundamentals first, and worrying about the rest of it later. Dangerous Driving’s selection of tracks eschew man-made cityscapes for the relative tranquil beauty of the countryside. Of course, this plucky British developer has to start somewhere, much as Criterion Games did back in the day with the very first Burnout game, which was a similarly streamlined effort back in the day. All the same, it does feel a touch churlish to criticize how the budgetary limitations of a relatively humble studio such as Three Fields Entertainment may have hobbled its ambitions given just how robustly Dangerous Driving manages to channel the core spirit of its classic inspiration. Looking to the future with hopeful eyes for Dangerous Driving’s commercial success, while a potential Dangerous Driving 2 should be quite something indeed, we can all take a considerable amount of solace in the very fact that Dangerous Driving is proof positive that Three Fields Entertainment knows how to deftly and reliably replicate that classic Burnout formula in contemporary labors. 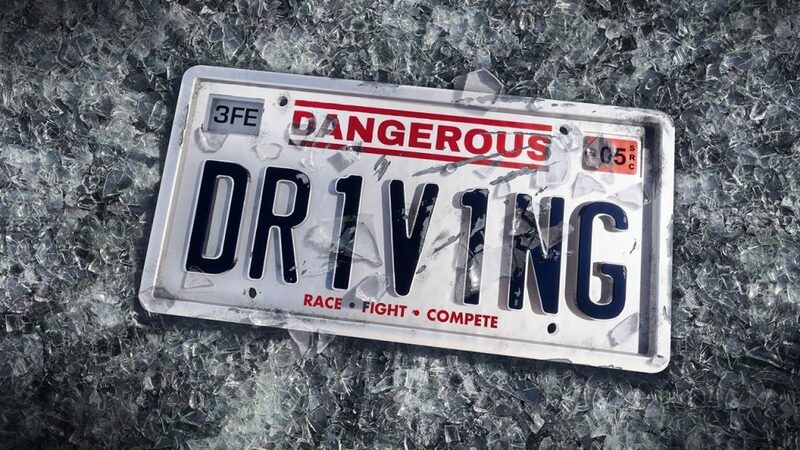 Dangerous Driving releases on April 9, 2019 for PS4, PC and Xbox One. I read on the Playstation blog that they have integrated Spotify into Dangerous Driving, letting premium subscribers use their own playlists or choose the dev team’s custom playlists to provide a soundtrack. That’s one way to avoid paying licensing fees, I guess. Welcome to the future, maybe?